It was a sloppy, ugly win, says analyst Matt Sabuda of the Buffalo Bills's 13-12 victory over the Tennessee Titans Sunday, but the result is important for a young team trying to build an identity. In holding the Titans to 221 total yards and forcing three turnovers, the Bills' defense may be exceeding expectations. The other side of the ball is a different story as the offense, including rookie quarterback Josh Allen, is showing few signs of improvement. Analyst Matt Sabuda discusses the Buffalo Bills during WBFO's Beyond the Playbook. After four regular season games, rookie Josh Allen has given Bills fans reason for hope (two touchdown runs against the Vikings) and for concern (two interceptions, seven sacks at Green Bay). Analyst Matt Sabuda expects fans to be patient for the near future, but a solid performance this Sunday against the Tennessee Titans is needed for the Bills to come away with a victory. The Buffalo Bills suffered a 22-0 loss to the Green Bay Packers at Lambeau Field, dropping them to 1-3 on the season. WBFO's Howard Riedel and analyst Matt Sabuda summarize what went wrong on this morning's Beyond The Playbook. WBFO's Howard Riedel and analyst Matt Sabuda talk Buffalo Bills football. The Buffalo Bills shocked the football world with Sunday's dominant 27-6 victory over the heavily-favored Minnesota Vikings. WBFO Bills analyst Matt Sabuda came away impressed by the performance of rookie quarterback Josh Allen. Following two awful losses to start the season, the Buffalo Bills head into Sunday's road game against the Minnesota Vikings as huge underdogs. According to analyst Matt Sabuda, as 16-point underdogs the Bills would make oddsmaker history if they were to win Sunday. In the last decade, only 20 games featured point spreads of 16 or more. Sabuda says the favored team won every time. For the second consecutive game the Buffalo Bills defense offered little resistance. After surrendering 47 points in their season opener against the Baltimore Ravens, the unit was ripped for 28 points in the FIRST HALF of Sunday's game at New Era Field. Chargers quarterback Philip Rivers completed 15 of 16 passes to start the game in leading his team to an easy victory, 31-20. Analyst Matt Sabuda expects changes in how the Bills coaching staff leads the defense in coming games. The decision to start rookie Josh Allen has sparked hope and concern among Buffalo Bills fans. As analyst Matt Sabuda points out, Allen possesses "jaw-dropping athleticism," but his "uneven performance" in relief of Nathan Peterman last week has worked to temper expectations. If the Bills are to contend with the Chargers in Sunday's home opener, Sabuda says the Bills game plan will need to rely upon running back LeSean McCoy. As they start the 2018 season, the Buffalo Bills are "like a scratch-off lottery ticket," says analyst Matt Sabuda. "There definitely is a chance that things could go well, but probably not." On the positive side, Sabuda looks to the new additions on the defense, including rookie linebacker Tremaine Edmunds. The biggest concern is the offensive line which Sabuda calls "a reshaped unit on the cheap." Analyst Matt Sabuda offers his thoughts on the Buffalo Bills on WBFO's Beyond the Playbook. The Buffalo Bills selection of Wyoming quarterback Josh Allen has sparked widespread reaction--a loud portion of which has been negative. Analyst Matt Sabuda offers a more measured response on a special edition of WBFO's Beyond the Playbook. While factoring in the many negatives found on Allen's resume', Sabuda sees the selection as "a high risk for a team that needs a high reward." Analyst Matt Sabuda reviews the Buffalo Bills performance on the first day of the NFL Draft during a special edition of WBFO's Beyond the Playbook. 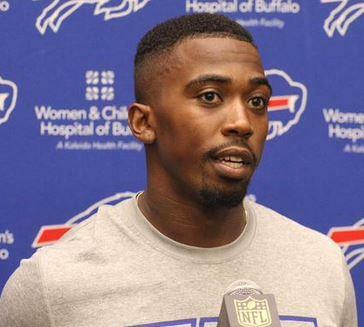 The Buffalo Bills have traded starting quarterback Tyrod Taylor to the Cleveland Browns in exchange for the first pick in the third round in the upcoming NFL draft. A 10-3 playoff loss at Jacksonville may have disappointed Buffalo Bills fans, but did little to diminish their passion. Analyst Matt Sabuda was among the thousands of locals who made their way to Jacksonville to witness the Bills' first playoff appearance in nearly 18 years. Sabuda said it was great to be at the game and "even greater to be a Buffalonian." Analyst Matt Sabuda discusses the Buffalo Bills on WBFO's Beyond the Playbook. With victories the next two Sundays, the Buffalo Bills would qualify for the playoffs for the first time since the 1999 season. Analyst Matt Sabuda, however, provides some sobriety to the holiday exuberance in highlighting the difficulty of the Bills winning Sunday's road game in New England. Still, for those of us longing for a post-season present, Sabuda lays out a scenario in which the Bills lose Sunday, but still make the playoffs. The Buffalo Bills beat the Miami Dolphins 24-16 at New Era Field on Sunday, to improve their record to 8-6 and keep their playoff hopes alive. WBFO's Howard Riedel and analyst Matt Sabuda look at the last home game of the year. For many Bills fans, the team's rivalry with the Miami Dolphins exists only in ancient history. While the teams battled four times in the playoffs in 1990's, their collective postseason fortunes have faded in recent years. The fire could return this Sunday at New Era Field. As analyst Matt Sabuda points out, the Bills need to beat the Dolphins in order to stay in the playoff race. The weather earned the headlines for Sunday's game at New Era Field. The Buffalo Bills kept their playoff hopes alive with a 13-7 overtime victory over the Indianapolis Colts, but most observers are still talking about the heavy snow that fell throughout the game. A Wall Street Journal reporter called the contest "delightfully ugly." Most Bills fans would agree, analyst Matt Sabua points out, provided their team wins. The Buffalo Bills find themselves in a familiar spot as the 2017 season winds down. As analyst Matt Sabuda points out, the Bills remain in the hunt for a spot in the playoffs. Of course, that "hunt" has come up empty for the Bills, who haven't appeared in a postseason game in almost 18 years. The bottom line, Sabuda says, the Bills have a small chance at the playoffs if they beat the Colts Sunday; almost no shot, if they lose. The New England Patriots dominated the Buffalo Bills in a 23-3 victory Sunday at New Era Field. The performance, however, was tainted by Rob Gronkowski's illegal hit on Bills cornerback Tre'Davious White. Analyst Matt Sabuda called the play "one of the worst cheap shots I've seen in years" and believes Gronkowski deserves a suspension. Oddsmakers listed the Buffalo Bills as 10-point underdogs heading into Sunday's game against the Chiefs in Kansas City. The 16-10 victory not only proved many experts wrong, it also renewed hope the Bills could end their record-setting playoff drought. Analyst Matt Sabuda advises cautious optimism, pointing out the Bills' record of 6-5 is a mark they've now reached four times over the last ten years. Reeling from three straight losses and a disastrous quarterback change, the Buffalo Bills will try to keep their fading playoff hopes alive on Sunday against the Kansas City Chiefs. Analyst Matt Sabuda is consoling hopeful fans against putting too much on the line. "My best advice is to not expect a lot." On the bright side, the Chiefs are also flailing after starting the season with five straight wins. Analyst Matt Sabuda previews Sunday's Buffalo Bills game during WBFO's Beyond the Playbook. The history of the Buffalo Bills is scattered with poor seasons. Twice, in 1968 and 1971, the Bills managed to win just one game, but those teams did not sink as low as what fans have seen in recent weeks. According to analyst Matt Sabuda, before yesterday, the Bills had never surrendered 47 or more points in consecutive weeks. A tough schedule only adds to a gloomy forecast for the rest of the season. Analyst Matt Sabuda discusses the Bills' 54-24 loss to the Chargers during WBFO's Beyond the Playbook. Buffalo Bills officials say rookie quarterback Nathan Peterman gives them their best chance to beat the Chargers on Sunday and revive their fading playoff hopes. Analyst Matt Sabuda, however, sees a longer view. The decision to bench starting quarterback Tyrod Taylor is more about sifting through personnel to find the building blocks for a team that could eventually contend for a championship. The success of that chosen path remains to be seen. Few losses in the 45 seasons of Buffalo Bills football at New Era Field were more lopsided than Sunday's 47-10 drubbing administered by the New Orleans Saints. As analyst Matt Sabuda points out, the loss doesn't end the Bills hopes for the playoffs, but their inability to compete should serve as a stark reminder that the organization is a long way from fielding a true championship contender. The New Orleans Saints visit New Era Field Sunday as the NFL’s hottest team. They have won six straight games, beating their opponents by an average of two touchdowns. Analyst Matt Sabuda believes the Bills defense—ranked fourth in the NFL in points allowed—face a stern test against quarterback Drew Brees. A future Hall-of-Famer, Brees is rated third among quarterbacks this season. The New York Jets' drubbing of the Buffalo Bills 34-21 in front of a national audience served as a reminder of the narrow separation of supposed playoff contenders and NFL cellar-dwellers. The Jets took advantage of poor offensive line play, says analyst Matt Sabuda. Without significant improvement, the weakness is likely to be exploited by future opponents. Coming away from Sunday's victory at New Era Field, the numbers are all positive for the Buffalo Bills. Their 5-2 record is their best after seven games since 2011. Their 4-0 record at home is the best since 1995, when Jim Kelly was still the quarterback. Beyond that, analyst Matt Sabuda points out that the convincing, 33-14, victory came against a Raiders' team "who many thought would contend for a Super Bowl this year." To this point, the 4-2 Buffalo Bills are exceeding pre-season expectations, many of which predicted a year heavy on losing to setup for a better position in the 2018 NFL draft. The good feelings will halt Sunday, however, with a home loss to the underachieving Oakland Raiders. Analyst Matt Sabuda believes the Raiders present numerous challenges, notably All-Pro Khalil Mack who created problems for Bills quarterback Tyrod Taylor when the teams met in Oakland last season. Analyst Matt Sabuda previews Sunday's Bills game during WBFO's Beyond the Playbook. Sunday's 30-27 win over the Tampa Bay Buccaneers improves the Buffalo Bills to 4-2 on the year. For analyst Matt Sabuda, the slim margin was notable because the Bills "just barely beat a team they were clearly better than." The Bucs dominated in passing yards and time of possession. That the Bills came out victorious may be a "sign of a more complete football team than we've seen in years." Analyst Matt Sabuda breaks down Sunday's Bills game on WBFO's Beyond the Playbook. The Bills surprising start to the season has given hope to their playoff-starved fans. With the Tampa Bay Buccaneers coming to New Era Field on Sunday, analyst Matt Sabuda believes the Bills "really need to beat (the Bucs) if they are to take the next steps" to being seriously considered a postseason contender. Tampa Bay comes into the game with a 2-3 record, middling stats on offense and defense, and an injured starting quarterback. Four weeks of good feelings for Bills fans faded in the rain of Cincinnati in a 20-16 loss to the Bengals on Sunday. The defense, analyst Matt Sabuda says, played well enough to win, but the offense failed to capitalize on exceptional field position throughout the afternoon. With only 166 passing yards on Sunday, quarterback Tyrod Taylor remains "the most glaring deficiency for a team that seems much closer to success than most expected." Analyst Matt Sabuda discusses the Bills' 20-16 loss at Cincinnati during WBFO's Beyond the Playbook. With a record of 3-1, the Buffalo Bills and their fans are enjoying a surprising perch atop the AFC East. While it's far too early to make bold predictions for the remainder of the season, analyst Matt Sabuda puts the Bills' strong start in perspective. During the team's 17-year playoff drought, the Bills have started a season at 3-1 or better only twice. Analyst Matt Sabuda previews Sunday's Bills-Bengals game during WBFO's Beyond the Playbook.